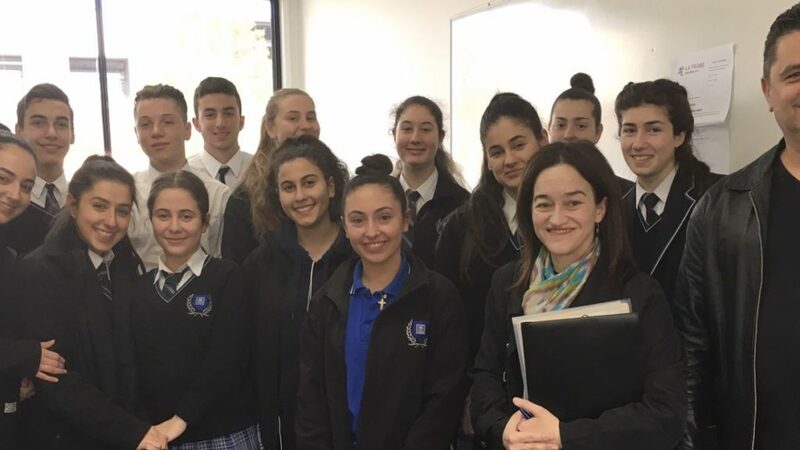 Last year, the instructors of the Programme, Dr Stavroula Nikoloudis and Dr Dimitri Gonis, visited a number of high schools, including Alphington Grammar. At the start of every academic year, many university students wonder which subjects they should include in their studies and how they should they go about choosing them. Perhaps the most important thing to keep in mind is that there is no right or wrong choice when it comes to the desire to expand one’s knowledge. The STEM subjects (science, technology, engineering, mathematics) offer many benefits, as well as the opportunity to contribute to research which may improve our collective quality of life. It is significant to note that the Humanities offer similar benefits, as well as the chance to critically examine what we actually mean by ‘quality of life’ and to determine which beliefs and values we wish to incorporate into our everyday lives – in other words, to decide what kind of human being we each want to be and what kind of life we wish to lead. Taking a history or politics subject in the Humanities equips us with the means to critically evaluate different systems of governments based on how they serve their communities, facilitating informed decisions at election time. Studying literature introduces us to stories that have become ‘classics’ in our store of human knowledge, such as the Homeric Iliad and Odyssey, Camus’ The Outsider, Cavafy’s poetry and Kazantzakis’ novels, to name a few. In all these works, we encounter characters and behaviours that offer us paradigms to follow or reject in our own lives. Literature allows us to learn from the experiences of others. The works noted above force us to contemplate whether we will glorify war or appreciate the utter despair and destruction that it brings to humanity (eg, Iliad), whether we will be easily disillusioned by life’s challenges or try to confront them with confidence and courage (eg, Odyssey), and whether we will be open-minded enough to understand the plight of our fellow human beings. The study of languages also yields precious rewards. Learning a language expands one’s awareness of other cultures. It brings relatives as well as complete strangers closer through direct communication in the same language. It exercises the mind, stimulating it so profoundly that it may even delay the onset of dementia! It enhances job opportunities in today’s globalised world, not only in terms of careers in translating and interpreting or teaching, but also in the fields of tourism and hospitality, social work, media, foreign affairs, international trade and more. In the business sector, many employers enjoy recruiting humanities graduates, recognising that while they can show someone how to carry out the calculations required for the running of their companies, they cannot teach someone to ‘think’. Critical thinking, careful analysis and creative problem-solving are key objectives of a degree in the Humanities. The Humanities inspire innovative ideas, value diversity and foster empathy, all of which help to produce informed, resilient global citizens, as well as more cohesive societies. The Greek Studies Programme at La Trobe University offers students precisely these opportunities. Our language subjects from Complete Beginners to Advanced levels attract students from Greek and non-Greek backgrounds and enable them to develop their linguistic and analytical skills. Our summer culture subject ‘Imagined Communities in a Contemporary World’, generously hosted by the Greek Centre in its building in the heart of the city, explores the settlement of Greeks in many countries around the globe. Our popular subject ‘Ethnic and Civil Conflict in Southern Europe and Cyprus’ introduces students to the possible causes and consequences of national and international discord. New in 2019, ‘From Homer to Slam Poetry’ will give students an overview of the development of Greek poetry, ‘Multicultural Australia’ will make use of the Dardalis Archives of the Hellenic Diaspora, and an overseas Study Tour will invite students to explore language and culture in Greece as part of their degree. Last year, the instructors of the Programme, visited a number of high schools (an initiative that will continue this year) in order to spread the word about Modern Greek Studies at La Trobe University. It is important to highlight that it is never too late to start learning a language. Of course, it is advantageous to start at a young age, but students who did not study Greek at primary or high school, or who discontinued their study, can view university as a “second chance” to learn the language, as it was aptly described by Venizelos Kapetaneas, from the Greek Consulate, who was helping our students improve their oral skills this past semester. We offer absolute beginners, intermediate and advanced (post-VCE) classes – we can find the most suitable class for anyone who is interested. What’s more, students studying at other universities can enrol in Greek at La Trobe. In addition to visiting schools such as Alphington Grammar, GOCMV-city, and Nestoras, the Greek Studies programme itself hosted a visit to the university by Strathmore Secondary College students. We thank all the teachers involved for their efforts and for the opportunity to inform students about our offerings. We ended the year in 2018 by presenting the Vassilogiannis Awards for high achievement in Greek Studies to four of our students. We congratulate all our students for their dedication, including our recent graduates (Bachelor of Arts and Diploma in Languages). We would also like to express our gratitude to the student members of LUGS (La Trobe University Greek Society) for an enjoyable and fruitful collaboration. Τogether we held a successful evening lecture last October celebrating the long history of Greek language and culture at the Greek Centre (with thanks again to the GOCMV for hosting us), we promoted Greek Studies at La Trobe at our department’s ‘Languages and Linguistics Day’ by dancing a kalamatiano at La Trobe’s ‘Agora’, or ‘gathering’/meeting place (one of several spaces around campus with Greek names), and we are working on some other interesting projects for this year. By taking up Greek Studies subjects and getting involved with a club such as LUGS, students can learn about Greek language, literature and history, celebrate their heritage or learn about a new culture, and also build lifelong friendships. Stavroula Nikoloudis PhD is a lecturer and Coordinator of Greek Studies at LaTrobe University. For more information about studying Greek at La Trobe University, please contact ASK-La Trobe or email the coordinator s.nikoloudis@latrobe.edu.au or visit our stall ‘Learn Greek at La Trobe’ at the upcoming Lonsdale St Festival (23 – 24 February 2019).